I've just uploaded new hi-res images of the Hidden Side sets boxes, taken at the NY Toy Fair and kindly provided to us by our friends over at Brothers Brick, which will make it easier for you to drool over them. The images I've used are those of the backs of the boxes, because the fronts do not illustrate what's inside. The box designers had a unique challenge of trying to show both what's in the box and what isn't -- the ghosts and other content that's only visible from the app. Take a look at the sample front of box image after the break and consider whether they've been successful or whether people will see them on the shelf and not really have a clue what it is. It's also interesting to note that it's labelled just 'Hidden' and not 'Hidden Side'. Given it's marked as preliminary that may well change before it hits the shelf, of course. Note that although the box is marked confidential photos were permitted at the event. I like the eyes in the Ds of "HIDDEN"
Without some adjustments to the box-front graphics, these would appear to be a tough sell to browsing shoppers, especially parents. In addition to appearing jumbled or confusing, the image doesn’t seem fit the LEGO branding style well, other than the LEGO logo. I don’t mean this at all as criticism; rather it is just an opinion. I honesty hope Lego makes ghost packs apart, the spectral monsters look great designed in the App but I hope it doesn't turn into a Lwgo thing to be removing things from sets. These are going to be fantastic! Honestly as it is now it looks like its promoting some companion game app ala 'skylanders' or Dimensions where you scan the product to add it into the game rather then it being AR. Also, with the 'kid' wandering around on their mobile phones, it looks like they're filming a low budget horror movie rather then being 'ghost hunters'. So yeah, they've not done a good job explain this theme I feel and I can see several of these sets becoming heavily discounted shelf warmers. Does this mean The Entertainer won't be selling these due to all the monster/demon stuff? From the vague whisperings I've heard, the reason all the boxes just say "Hidden" is 'cos the theme went through some namechanges in development and this was one of them. Since these boxes were non-finalized development versions it's still got an older name, but it'll def be Hidden Side on there when it launches! As for my thoughts on the boxes themselves, it's properly interesting to see TLG shake up their boxart this much since it's very much uncharted territory for them - I don't think they've done something like this before have they? The LEGO logo being all the way over in the right-hand corner gives me early-noughties "pretending to not be a LEGO set" vibes which isn't great in my book (albeit not as bad as back then thank god), but aside from that it all looks fine to me honestly. I'll prob give more thoughts on it once we get final box pics, but for now I'm settling with a big ol' "it's decent I guess". so ldd/BrickLink Studio 2.0 on the back and Video Game/ar on the front. That is some visually confusing front box art. Now if ever it would've been a great idea to have box flaps or something to distinguish between 'normal' and 'spooky' modes (I'm arguing towards it moreso in terms of flavor than feasibility). Really excited about this theme. The sets look great and super useful in combination with many other themes. And basically I’m just happy to get a fishing boat. The AR-part doesn’t interest me so much, but I guess LEGO has to experiment with new technologies, if they want to still be relevant in 10 or 20 years. Anyway I’m looking forward to try it out with my daughter. Is Lego using 3D renders instead of physical models on the box? I would rant more but I’m going to puke. 40 years ago people were offended by Michael Jackson's Thriller and nowadays people get upset over "demonic" things on a LEGO box. I just think they should have the LEGO on the front and the AR on the back, with a phone on the front to show. I assume children and adults want to see the Lego first then playability / app 2nd. For me I'd have to pick the box up and turn it around before I knew I wanted it. Would some people even bother to do that? Almost looks like a game box. These sets look intriguing to say the least. I’m not a fan of the ghostly story in the app so I’ll probably get these sets for play, parts, or not get them at all, depending on the set. Fairly recently I started keeping and collecting the boxes to my sets, but I’ll probably pass on using up space for these boxes. The cover looks more like an advertisement or poster for the whole theme then an illustration of what you are buying. Clearing my mind of knowledge of the theme for a moment, when I look at the front-of-box art I think these are essentially board games with a companion app, some printed cardboard matte panels, and a limited number of basic buildable LEGO props to pose around the scene. I don't at all expect the boxes to contain fully-developed, complete, intricate LEGO sets with purely optional digital experiences. Never before has a LEGO theme so thoroughly needed electronic in-store demo displays (complete with a mock phone with a little AR-simulating video on loop) to convey exactly what it's about. It's quite a daunting package art design challenge, indeed, but I do feel they made a bad choice using unrealistic (bendy) poses for figures on the fronts of the boxes as shown at NYTF. I'm fine with good renders if they're properly representative of the product. Showing bendy minifigs front & center is either light false advertising or confusing, with the intentionally unrealistic style pushing strongly towards the latter. That said, I think this theme could be really, really good, and worthy of extending forward with new "seasons" of content. It's just the packaging that gives me frightening Fusion flashbacks. Surprised at how people are like "ooh it's demonic!" I guess they've never heard of bands like Mayhem or Behemoth... there's a lot of stuff to actually get offended over, other than a bunch of plastic bricks. These look amazing, though the boxes will hopefully improve. did huw just post a "confidential" lego image? Personally, I don't like it one bit. I don't mind the scarier aspects (given some of the licensed characters Lego uses. Has anyone read a recent comic book starring the Joker? ), and c'mon, it's Lego. But it just ... doesn't look like Lego. I see people being more confused than intrigued. I had this conversation with someone on FB the other day in a Lego Trains group. We were talking about the Hidden Side train (which actually is growing on me), and he was talking about how Lego was branching out, utilising more things for play value than just the bricks in the packet. And I just thought, at what point was the play value in a Lego set *not* the actual Lego set? That seems weird, to me. Every now and then, I get flashes of the early 00s (when Lego seemed to forget what it actually was), and it makes me wonder. Ghosts are demons? Do you people even hear yourself? Nexo Knights had 'lava monsters' which were just little demon like creators. No one batted an eye. I swear the human species is devolving. Anyways the box is awful. It doesn't clearly show what is in the box or what the set is about. It's a mess. We keep calling the theme Hidden Side, yet no where on the boxes has the word 'Side' ever been shown. So isn't the theme name just 'Hidden' then? What's on the front and back of the box is one thing, which way round the shelf stackers in stores put them on the shelves is quite another! Outside of brand stores I can see whoever else does stock it displaying the "back" of the box facing the customer. The front-of-box photos are a bit of a departure from usual Lego packaging, but the back seems to clear things up pretty well. I suspect my grandson would spot the phone on the box and be drawn in by that, as he's actually more interested in playing with apps than with bricks. I plan to get at least one of these at release just to check out the app and see if it helps get him more into building. If I was that box on the shelf among a bunch of other Lego, I'd pick it up for a closer look just because it looks so much different than "normal" Lego packaging. As for the ghosts, they don't look any scarier than ghosts from old Scooby Doo cartoons. “Demonic”!? Lol! You people are joking, right? First off, open a dictionary for the first time in your life and learn what a definition is. Secondly, you people complaining about the darker aspect of this need to learn one main thing about life - if it bothers you that much then don’t buy it or even look at it! The world is not designed to change around YOU! These are great sets, and a great idea. Lego has definitely gone much farther outside the box (no pun intended) with this theme. Imagine working movie scenes into sets that could add another level of play for kids. While I’m not the biggest fan of getting kids to stare at a screen more than is necessary, I hope that this takes off and Lego extends this concept to more product lines. @Brickmasterboy IMO they haven't gone far enough with the demon stuff, but hey, to each their own. Given that 10228 Haunted House is one of my all-time favorite LEGO sets I don't mind the "demonic" aspect one bit. I do think though that the packaging design leaves a lot to be desired. As a parent I wouldn't think of buying one of the sets going by those front images. 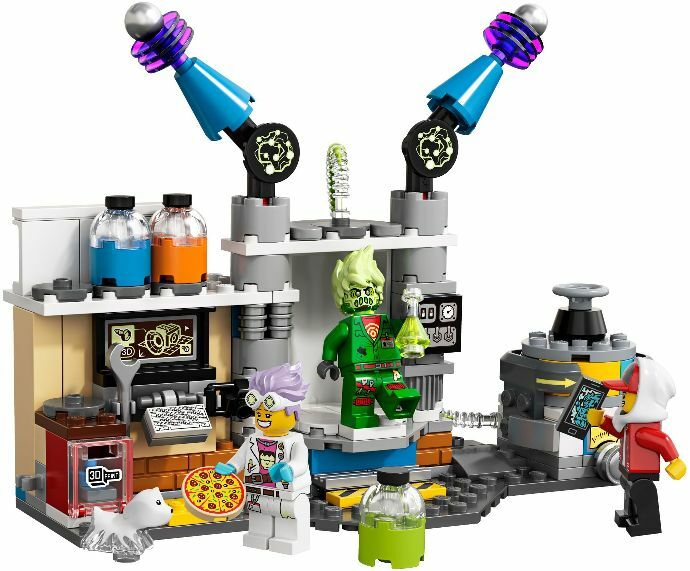 But as I know that some of these are cool sets I will definitely buy some of them albeit once they are available at a discount - which is bound to happen sooner rather than later imho. I generally do not comment on these threads, but like others on here, I am glad to see Lego finally doing an original theme again. An aggressive marketing campaign will serve the line well as far as the box appearance goes. For that matter, I saw some Overwatch sets in the store the other day and my eye went right past them at first as they did not look like Lego sets. As for the so-called “Demonic” element, just don’t buy them if that bothers you, stick to the Friends line….oh wait….they have elves and trolls….um, Star Wars sets, well…….no………….Darth Vader and the Emperor, pretty evil………Duplo is always nice. I can't wait to get all of these! As for the "Demonic" look... if it's not for you fine, but don't tell me it's not for me. If you're offended, grow up. First, it looks more like the inner side of a flip cover than the front of the box. Second, are the "demonic is offending" comments for real ? If so, this is beyond ridicules. Do parents prohibit their kids from trick or treating these days ? It's an 8+ toy, what's wrong with you people ? Asking what's wrong with some LEGO fans on here is a topic one could do for their psychology thesis. We don't have the time to really analyze it. The logo looks like the 60's Scooby Doo, which is awesome. @gamer1`3 and @Brickmasterboy: LEGO ghosts have been a thing since 1990, even if they weren't very scary. I don't see how either these sets or the box art are any more "demonic" than popular kids' brands from the 80s and 90s like Ghostbusters or Goosebumps. Do y'all really want to go back to the days when LEGO executives would threaten to fire some of their best designers for even jokingly putting a minifig skeleton in a prototype for a future set? @Lordmoral: I don't think it's accurate to describe the ghosts as being "removed" from the sets… with most of the sets, the number of minifigures are about what's normal for City sets their size (three in the smallest set and seven in the largest). They would probably simply have ghost/monster minifigures in place of the possessed minifigures if the idea of the ghosts being "hidden" to the naked eye and only visible with special technology weren't the theme's core concept. @TheJANG: Personally, I feel almost the opposite way about the bendy minifigures — using them helps to clearly differntiate for buyers which pictures are imaginative/fantasy scenarios with effects that aren't in the physical products and which are pictures of the products themselves. Also, at this point, stylizing minifigures to move with more flexibility than the physical products is commonplace enough in promotional images and media that I can't imagine a lot of kids being particularly confused about it in any image that isn't designed to seem photorealistic. Ninjago routinely has stylized character illustrations on the front and back of the boxes, and its popularity certainly doesn't seem to have suffered for it. 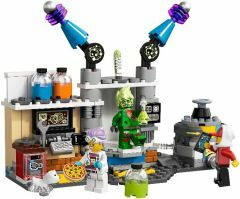 @ProfBrick489: Interestingly, some sets still DO primarily show kids playing with the sets on the front, even if it means some of the sets' actual contents are only clearly shown on the back! For example, the LEGO Ninjago Spinjitzu Masters sets (https://brickset.com/sets/theme-Ninjago/subtheme-Spinjitzu-Masters) and Dragon Masters sets (https://brickset.com/sets/theme-Ninjago/subtheme-Dragon-Masters). I suspect that with these sets focused more on action play than storytelling play, it's more important for buyers to see what playing with them is actually like than how the launchers are built or what accessories are included. @Zordboy: I mean, to flip that around, a lot of LEGO's most successful themes have had more to them than the bricks alone. Fabuland set instruction manuals and some Duplo instruction manuals have taken the form of an illustrated storybook so kids can build alongside the characters. Many Bionicle sets included mini-CDs and/or codes that you could use in software or online to unlock digital content. Other themes like Exo-Force, Hero Factory, Legends of Chima, Minifigures, and Nexo Knights have since dabbled in digital content codes that you either type into a website/video game, or in Nexo Knights' case, scan using a tablet/smartphone. Early Ninjago spinners frequently included illustrated trading cards that could be used to enhance the play experience. Bionicle and Super Heroes sets have frequently included mini comics to help contextualize the storyline surrounding the characters. @David1985 and @Kostur: This box art is all still super preliminary. 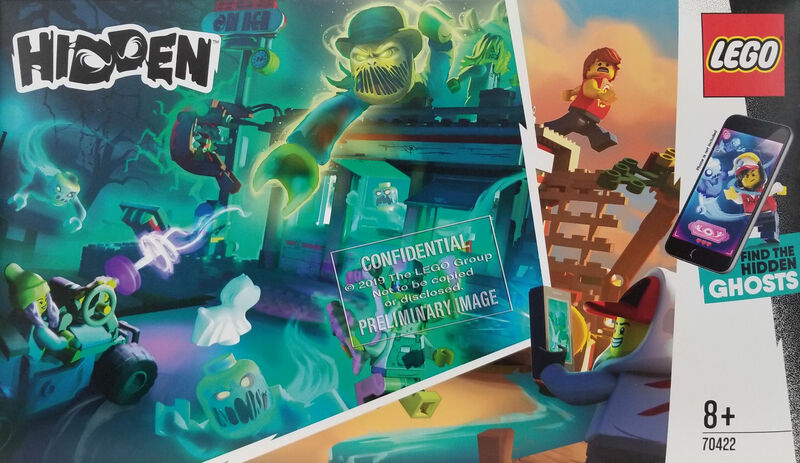 The press release (https://www.lego.com/aboutus/news-room/2019/february/lego-hidden-side/)and teaser site (https://www.lego.com/en-US/themes/hidden-side) both give the name as "Hidden Side", so that's presumably what will appear on the finalized box art. Some sites like https://news.toyark.com/2019/02/16/toy-fair-2019-lego-hidden-side-333586 also shared pics of the minifigure lists on the top of the boxes, and many of them assign the characters names that are inconsistent, misspelled, or obviously just placeholders. For instance, the school set has characters labeled "Kid 1" and " Kid 2", while the train set has one character identified simply as "Person"! I really hope Lego changes the final boxes if they're hoping to sell any of this. As others have said, the fronts are just super confusing, it's not possible to see the actual model AT ALL while the "bendy" figures borderlines to false advertising, they shouldn't expect the customer to pick up the box and look at the back to see what it's all about. Worse, it puts WAY too much emphasis on the "app" part, giving an impression that it's *required* to use the set. Given the backlash about Boost (only working with a limited number of tablets) and Dimensions (overpriced and lacking printed instructions) that's a sure-fire way to make potential buyers stay away in droves. Personally I'm mostly interested in the graveyard, the boat and the school, they could work well with the Fishing Store and the Haunted House to make some kinda Newburyport/Innsmouth scene. The main issue is that I'd need two school sets and lots of additional dark red pieces to make it a complete building. Also, am I the only one who thinks the "possessed" beard pieces (especially the train driver one) looks more like zero-G vomit? As such I'd think they'd work great as accessories for the Rollercoaster set. Anyway, I think the illustrations look awesome and do a cool job showcasing both the physical and digital transformations from ordinary daytime scene to haunted nighttime scene. But seeing as the boxes as a whole are still so preliminary I don't think it's all that realistic to judge them on their effectiveness at this point. In the very least, it goes without saying that the final boxes will have more text like the set and full theme name, and maybe a smaller image on the front highlighting the physical contents (similar to the LEGO Fusion box art: https://brickset.com/sets/theme-Fusion). I would also expect the low-quality renders on the back of the boxes to be replaced with photos, at least in the lifestyle pics that have show kids' hands interacting with the physical products. And captions describing the nature of the product and gameplay are almost inevitable — in the United States, at least, I'm pretty sure disclaimers about what contents do or don't appear in the boxes are an actual legal requirement. Showing these preliminary boxes at Toy Fair was probably just to give retailers a sense of the theme's art direction, graphic design, and perhaps most importantly, the relative SIZE of the boxes (important for anyone who wishes to work on a shelving plan before ordering new inventory). This is far from uncommon, and in some cases (especially with licensed themes that need licensor approval on the final art), the placeholder boxes will be almost completely blank aside from the LEGO logo, set number, target age, and theme name. Bionicle box art was also often heavily stylized to reflect how the characters might look in-universe, with weathered textures, glowing eyes, dramatic lighting, and poses that might not be stable or even possible in real life. For the most part, this didn't seem to negatively impact either the theme's sales nor fans' nostalgia for it. And of course, the advent calendars usually feature fanciful illustrations on the box cover rather than a clear picture of all the contents so as to preserve the surprise! I'll definitely be paying close attention to future teasers or image reveals for this theme! Ohhhh man, I love me some hi res confidential images. Thanks guys for posting these! Considering the question posed in the article about "whether people will see them on the shelf and not really have a clue what it is", I think that's sort of the point. If the boxes looked the same as pretty much any other Lego boxes, they would not grab attention to nearly the same extent, or make the gameplay features that make up a huge part of the theme's conceit apparent at first glance. A less traditional boxart style has the potential to make customers do a double take, at which point they can confirm that yes, it is in fact a Lego set, and yes, it is also part of a new mobile game experience. Granted that, I love Thunbear's suggestion about front flaps that could reveal both the "normal" and "possessed" versions of the set! In the '90s, that would have been the kind of thing I'd love to see... but I can see why it wouldn't be considered for a theme like this, in an era in which Lego has been taking steps to minimize the size and amount of material used for its boxes for both economic reasons (increasing the number of sets that can be packaged in a standard shipment and reducing the cost of the packaging itself) and environmental ones (reducing the amount of waste material and the environmental impact of shipping mass quantities of sets). I imagine that if LEGO is emphasizing the app on the front, it's because they built this product line with the idea in mind that there is a segment of the market that is more interested in buying an augmented reality game than in buying a Lego set. They aren't trying to convince you to buy this LEGO set over some other LEGO set. They're trying to convince parents and kids to buy this buildable AR toy over some other toy or game. For this product, the AR game is the differentiator. For another product they make, i.e. the LEGO Creator line, the differentiator is being able to build and rebuild it. My ONLY concern is bricks per price. I like the looks and feel of the sets. But I worry that the prices will be like 20cent per brick due to paying for the app development and set AR animations. That will make me not buy any. Lol, these comments about Hidden Side being "Too demonic" and such are absolutely ridiculous. There's nothing more demonic about it than say Ghostbusters or Scooby Doo. It's spooky fun and the sets look awesome! So go cry a river and say an extra prayer if you feel the need to. It's just Lego folks! @lewtz: The link at the beginning of the article goes to the theme in the Brickset database where you can see all the sets’ piece counts, price, and price per piece in USD (revealed at NYTF). For the most part the price per piece is close to what you’d typically see in any other theme, so it doesn’t seem like any price hikes can be attributed to the app. All the sets are below 10 cents per piece except the lab and the train. I suspect the app development is budgeted similarly to the TV series developed to accompany themes like Ninjago and Nexo Knights, which likewise don’t appear to affect the price of the sets. @Aanchir From the demos & promos I've seen so far, it does not seem that the main minifig characters get animated in the AR experience at all. I agree that AR-only animated objects are fair game to go bendy, but plastic minifigs that are only plastic minifigs shouldn't be depicted with features they don't... wait for it... ...possess. You guys are still whining about me saying "it's demonic"!?! It was like 2 comments! I just dont agree with lego on this ocasion,OKAY! ChrisBricks81 i never said ghost busters wasnt demonic? @gamer13: the simple fact that you’re this touchy about the way people are reacting to your opinion says more about you than it does anyone or thing else. Can we just accept others' opinions, maybe give them some criticism and clarify stuff, but just leave it at that? Saying stuff like "the human species is devolving" just sounds like you're trying to hurt the guy. Hey pal, just know that there are those of us who agree with you. Don’t let an oppressive (and very small minded) majority (or so they think) bully you into thinking that your views are less then or not welcome. (By your name I assume you love this theme) if almost an entire community came against your personal views (however correct or incorrect they might be) would you not try to defend yourself?? I couldn’t agree more. Well put. I have noticed a few very vocal members (I won’t name names) who have a mentality that think that they are superior and no one else should or can disagree with them in their right mind. There are those of us who have moral codes. And just because yours is different (or nonexistent) doesn’t mean others don’t have one. And SO WHAT if people don’t like it?? Does it somehow disturb your life and throw it into disarray if some person somewhere in the world dislikes a lego set? That alone “says more about you than it does anyone or thing else”—@spartan ghost. A few jumps to conclusion later,(and my clouded judgement due to my anticipation for this theme) i hastily decided to call @gamer13 out on their... what i thought was hubris. All that to say, i was in the wrong, i could have handled it better, and i am truly, deeply, sincerely sorry. Not that anyone will believe me. These pictures are the backs of boxes. You can see the finger punchhole at the edges that is only ever on the back of Lego boxes. The images of the models in the boxes look like low quality LDD renders. I suspect these are early drafts. I'm Looking forward to this theme, it is a bit more edgy than usual Lego City or whatever but no more so than other kids toys. @The Ultimate Authority I totally agree with you and @Gamer13. It's just pathetic how people get so offended by an opinion and act so sensitive about it. Thought people were more mature here. Also I mentioned Ninjago as "demonic". What else would you call the Oni masks? "There are those of us who have moral codes." And you're applying this high sense of morality to a Lego theme? That's the part of this where people are going, "eh?" In a DC storyline a few years ago, the Joker used a knife to cut off his one face and wear it like a mask. Where was the moral outrage then over Lego making Joker minifigs? That's just sunshine and daisies, right? I went to a high school that banned Harry Potter (how dare the books portray witchcraft and wizardry in a positive light?). You know how stupid all the kids thought that was? You know how quickly we all went and read the damn things anyway? (I didn't even think the books were that good. I still read 'em all though) There's a point in there. And it's weird, because I don't even like the looks of some of these Hidden Sides sets, but now I want to go and buy them all anyway, just because. Heaven forbid we tell kids that monsters actually exist, right? @Brickmasterboy: The idea that LEGO has characters resembling spooky fantasy demons/monsters/ghosts isn’t in dispute here… I think most people are just bewildered that y’all seriously think that entirely imaginary spooks and specters make a toy or brand inappropriate for kids. Even if you believe in demons or ghosts or whatever, that doesn’t make the ones in these sets any less made up. Furthermore, the spooky characters like these are almost invariably shown as the bad guys, and it’s certainly not as though these themes are teaching kids to perform occult rituals or any such nonsense. So I’m really not seeing where the supposed issue lies. So now people here are hiding their ignorance behind some made up 'moral code'. If you don't like the sets because it's a big expensive wall set or something, fine, but now we are getting into BS about morals over fake ghosts in a LEGO set. You are allowed to have a differing viewpoint and we are allowed to call you out on how insane it is. I love promotional artwork and posters of LEGO figures, a-la Ninjago, but... did they really have to do that for the box art? I think I've said it on Hidden Side reports before, but all of the fan taken images of the actual sets and toy showcases have got me way more hyped and interested in the products than these posters or the weird CGI on the reverse side. I find it funny how many people are responding to the "demonic" complaints with people being so easily offended nowadays and how they need to grow up. Calling things "demonic" just 'cause you don't understand them has been done for ages, especially with rock groups in the 60's and 70's, you could even trace it all the way back to Salem if you wanted to, and it's usually the elderly that complain. Heck, in the 1800's, just insulting someone's mother was enough for you to both whip out pistols, take ten steps, and shoot. Humans have always been this prone to overreact and demanding, the internet and increase in empathy/pack-bonding in youths has just made those complaints more public and widespread than before. That all being said: LEGO's done ghosts before what's the big whoop? There’s defending you’re opinions & beliefs, and then there’s being defensive. As for people calling these demonic, I grew up watching Scooby Doo with stuff like this..
and nowadays I only make blood sacrifices on the rare occasion that the dark master demands it. I'm not interested in these, but I sure hope it doesn't fail, as I'm sure Lego has invested a TON of money into it. I.E. Life of George was a huge flop, but at least it had no new molds. The adorable body and features of a minifigure could never be considered “demonic” unless you’re a bible thumping lunatic...they are toys. Allowing your children on social media is 100 times more destructive than a silly scary face on a mini figure.